Though turning 36 isn't seen as a major milestone, that doesn't mean you can't celebrate this birthday in style. Throwing a 36th birthday party can be a great way to show the guest of honor how much friends and family care, but still let your hair down and have some fun. When planning a 36th birthday celebration, there are plenty of ideas to choose from. Wine tasting can also be a fabulous idea for birthday parties if the birthday boy is into wine. And if not, this is one of the best ways to learn about wine. He doesn't need to be a wine buff to enjoy this 36th birthday party theme, but it helps if he enjoys drinking it. 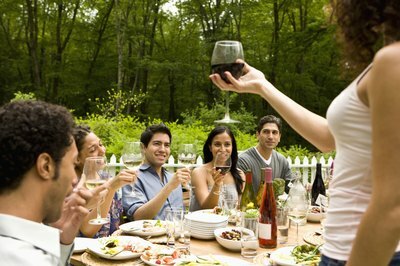 Wine tastings can be very casual, but should be balanced with other activities, such as a game of charades or karaoke, to keep them from getting stuffy. Provide spitting buckets, wine glasses, at least four different wines to sample and complementary foods such as cheese and crackers, smoked salmon and fruit skewers. When choosing wines, try to pick a theme, such as wines from California, roses and pink wines, South African wines or wines from Italy. If you live in wine country, rent a shuttle to drive the party to different wineries and check out the vineyards. Did you know the 36th parallel runs through Las Vegas? Well, Henderson, which is right outside of Vegas. But who cares? The best thing about this birthday theme is its versatility — practically any type of games you have that the birthday guy or gal enjoys can be used. Pool, cards, board games, darts, roulette, dominoes and even video games are well-suited for this theme. If you want to take this 36th birthday party idea from casual to sophisticated, specify on the invitations that guests should arrive in cocktail attire. Provide classy, tasty food and drinks, such as cosmopolitans, martinis, mini-souffles, steak bites and individual cheesecakes. For decorations, keep things simple and opt for solid-color tablecloths, flower arrangements and serving ware in the colors of gold, black, white and red. Bowling is a great idea for any age, and for most people in their 30s, it is a fairly stress-free party planning option, since all you need to do is book a few lanes at your local bowling alley and bring a cake. Food, drinks, decor, music and entertainment will already be there. If you are in a time crunch, this is a perfect 36th birthday party to throw since invitations can be sent as little as a week in advance. Send email invites to keep with the casual atmosphere of the party. A bowling party can also work well as a surprise party. 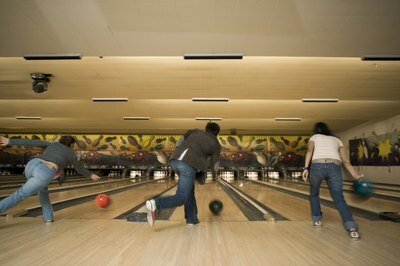 Simply have your guests arrive at the bowling alley 30 minutes before you do, take the guest of honor out for the evening and lead them to their birthday celebration.